The 2005 Suzuki SV650S is a mid-range faired bike base on the naked SV650 and is powered by 645cc V-Twin engine which puts out 69bhp. It was originally launched in 1999 and updated in 2003. The liquid cooled 645cc V-Twin engine produces 69bhp at 9,000rpm and maximum torque at 7,500rpm. Improvements over the 2003-2004 model include a black finish frame and swingarm, mini smoked fly screen, new narrower radiator design, black coated wheels and black lower fork tubes. The 17" cast Aluminum wheels take a 120/60 tyre at the front and 160/60 at the rear. The special edition SV650 Sport was launched in 2007 and was basically an SV650S with additional lower fairing and tail cover. The 2007 engine had 2 spark plugs added to meet emission standards, and then in 2008 decals were added e.g. a strip to the fuel tank and front nose cone. 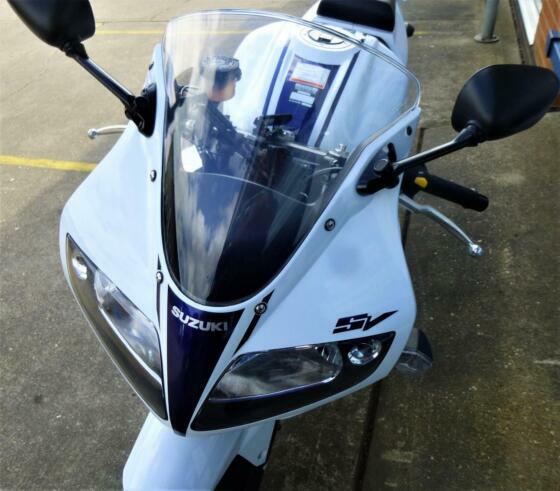 For 2009 it was the only SV model in Suzuki's UK lineup until the standard SV650S returned in 2010. I have the SV650S fully faired. Overall it's a lovely bike and its got ample power that you'd need for street legal fun. I ride 50% with a pillion and the torque from the v-twin helps a lot in this as to be honest you don't feel like you've even got a person on the back! I did hear that having a lot of weight on the back using the box can sometime crack the braces around there, so it won't haul stuff like a tourer would for example, but decent enough. and going back to the V-Twin, it hasn't got much top end power, as in you won't feel a rush of thrust as you would from an inline 4 above 6-7k rpm.